Dinosaurs are fascinating, and not just to children. People all over the world love dinosaurs and love learning about these extinct animals. What better way to get students engaged and loving reading, than with dinosaur books for kids. By giving students multiple opportunities to read stories with dinosaurs as the main characters, you’ll instill a love and intrinsic want to keep reading. 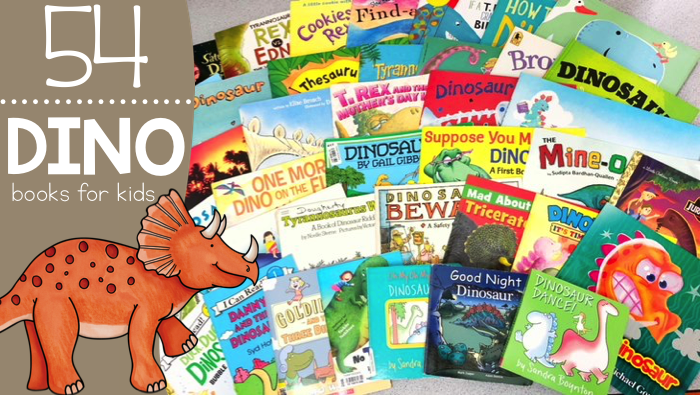 Enjoy this special curated list of 54+ dinosaur books for kids that are perfect for any elementary classroom. Jurassic Park (Little Golden Book) – In 1993, Steven Spielberg introduced audiences everywhere to Jurassic Park and now the movie’s youngest fans and dinosaur enthusiasts can relive the movie in this fun, action-packed–and age-appropriate–Little Golden Book adaptation of Jurassic Park! Jurassic Park – The Movie Storybook – an illustrated storybook based on the action-packed film. Oh My Oh My Oh Dinosaurs! – Dinosaurs make learning about opposites fun in this story! Good Night Dinosaurs – Part of the Good Night Our World series, this educational board book brings to life the prehistoric world and introduces children to all the creatures and natural wonders of that time. No T.Rex in the Library – It’s a quiet morning in the library until a little girl roars out of control! Tess resigns herself to a time-out, but finds that she must be the one who has to maintain order when T. Rex leaps from the pages of a book into real life. Suppose You Meet a Dinosaur – A First Book of Manners – A little girl is shopping in a grocery store when—surprise!—she meets a dinosaur. Don’t worry. The dinosaur is very friendly. This book is great for teaching manners! T. Rex and the Mother’s Day Hug – It’s Mother’s Day and T.Rex wants to do something for his Mama instead of buy something for her, but will she love it? ABC T-Rex – T-Rex loves the alphabet so much, he wants to eat it up. So he takes a bite or two, and he finds that C is chewy, D is delicious, and K tastes great with ketchup! The Mine-o-Saur – The Mine-o-saur takes all the toys at recess, and soon no one wants to play with him. What will it take for the Mine-o-saur to realize that what he really wants are friends? Dinosaurs (Gail Gibbons) – Gail Gibbons presents the most recent and up-to-date theories about the history of dinosaurs and dinosaur discoveries. Each dinosaur is explored in just the right amount of detail for young paleontologists, as this book brings these magnificent creatures to life again. Jurassic Poop: What Dinosaurs (and Others) Left Behind – Hold your nose and take a journey back in time to see what tales ancient poop has to tell. How Big Were Dinosaurs? – With kid-friendly text and seriously silly illustrations, this fact-filled book puts dinosaurs next to modern animals so that you can see exactly how they size up. Dinosaur Bones – Filled with fun dinosaur facts, the author shakes the dust off the dinosaur bones found in museums and reminds us that they once belonged to living, breathing creatures. Goldilocks and the Three Dinosaurs – a new take on a classic fairy-tale, so funny and original that it could only come from the brilliant mind of Mo Willems! Dinosaur VS. The Potty – A silly story about how dinosaur doesn’t need to use the potty… but that’s not a victory dance, that’s a potty dance! Brontorina – Brontorina has a dream. She wants to dance. But Brontorina is rather large. An irresistible story that proves that no problem is too big when the heart and imagination know no bounds. Dinosaur Roar – The perfect way to teach adjectives to your students, with brilliant illustrations to catch every student’s attention! Danny and the Dinosaur – Danny loves dinosaurs! When he sees one at the museum and says, “It would be nice to play with a dinosaur,” a voice answers, “And I think it would be nice to play with you.” So begins Danny and the Dinosaur’s wonderful adventures together. Tyrannosaurus Wrecks – Dinosaur riddles to make anyone giggle! Tyrannosaurus Math – From the moment Tyrannosaurus Math (T-Math for short) is hatched, he views the world in mathematical terms. The book covers 15- mathematical concepts with beautiful illustrations. Dinosaur Dance! – Whether they dance the Shimmy Shimmy Shake, the Quivery Quake, or just decide to Cha-Cha-Cha, young readers are sure to giggle along with these adorable creatures that are ready for a ROARING good time! Duck Duck Dinosaur: Bubble Blast – It’s bath time for two little ducklings and one big dinosaur! Spike loves soap, but Feather and Flap don’t want to scrub. What will Spike do to make getting clean fun for everyone? Grumpy Dinosaur – A little Dinosaur gets annoyed easily, sometimes for no reason at all! Simple rhymes, cute characters in adorable settings, and sweet, comforting addition to your child’s nighttime routine. One More Dino on the Floor – One by one (and all the way up to ten), the dinosaurs get their groove on in this delightful counting book! The Dinosaur That Pooped a Planet – When Danny realizes he’s forgotten Dino’s lunch box, the very hungry dinosaur eats everything in sight, including their only way home: the rocket! How will Dino get them back home? Tyrannosaurus Drip – Everyone knows that tyrannosauruses are big and scary, so when a placid duckbill dinosaur’s egg ends up in the wrong nest, confusion is sure to ensue! Dino Duckling – Even as an egg, Dino Duckling is different from all the other baby ducks. And when he’s born, no one seems to notice that he’s actually a dinosaur! Can Dino Duckling ever truly belong? How to Grow a Dinosaur – A useful “guide” for existing big brothers and sisters and for every big brother and big sister to-be. If a T.Rex Crashes Your Birthday Party – You never know what will happen when a T. Rex crashes your birthday party. Harry and the Bucketful of Dinosaurs – Harry finds some old dinosaurs in his Grandma’s attic. Harry and his dinosaurs go everywhere together… until he leaves them on a train! Dinofours – It’s Time for School! – Dinosaur toddlers Albert and Brendan are disappointed when the first day of school proves more difficult than they anticipated, and both of them begin to miss their mommies very much. Mad About Triceratops, T.rex, Stegosaurus and Other Dinosaurs – With fast facts and stunning photography, this book is sure to entertain and fascinate young readers. Dinosaurs, Beware! – Over 50+ safety tips are demonstrated by dinosaurs in situations at home, during meals, camping, in the car, and in other familiar places. Dinosaur Kisses – Young children will chuckle and cheer when Dinah finds just the right creature for her dinosaur kisses. Find-a-Saurus – Marty discovers all sorts of other weird and wonderful creatures–from aliens to unicorns to giants–but Marty isn’t interested in them. He won’t give up until he finds a dinosaur…no matter HOW long it takes! Cookiesaurus Rex – As soon as Cookiesaurus Rex comes out of the oven, he declares that he is King of All Cookies. He should be frosted before all of the standard-shaped cookies… but wait one stinkin’ minute! Tyrannosaurus Rex wants breakfast. He stomps and he roars and he gnashes his teeth―and he scares all the other dinosaurs right out of the forest. Only Edna, the very first chicken, is unafraid. But will Edna’s mighty beak and terrible flapping wings be a match for T. rex’s mighty claws and terrible jaws? Saturday Night at the Dinosaur Stomp – When it’s rock ‘n’ roll time during the prehistoric era, many different kinds of dinosaurs gather to twist, twirl, and tromp at a Saturday night party. Doris the Bookasaurus – Doris loves to read, but her two little brothers do not… but soon they’re using their imagination for on an epic adventure to Sharktooth bay. Dinorella: A Prehistoric Fairy Tale – Dinorella’s dreadful stepsisters, Doris and Dora, say that Dinorella is too ugly and dull to go to the dance, until Fairy-dactyl comes to her aid. Thesaurus Rex – This playful dinosaur will slither, skid, slide and glide his way into children s hearts! Encourage children to explore synonyms with the loveably cheeky Thesaurus Rex, who has an irresistible way with words. Dino-Wrestling – The Dino-Wrestling Jamboree is ON! Just what will happen when the Diplo and Ptero tag teams rumble in the WWD fight? You won’t want to miss this action! Digging Up Bones – Get your shovel and let’s dig up bones! This awesome archaeology book is a must-have for little scientists. Dinosaurumpus! – Shake, shake, shudder … near the sludgy old swamp. The dinosaurs are coming. Get ready to romp! Cookiesaurus Christmas – Cookiesaurus Rex may not be your usual holiday treat, but he has plenty of Christmas spirit. And he would like nothing more than to make it onto Santa’s cookie plate. Dinosaur Rap – A rhythmic introduction to the Triassic, Jurassic and Cretaceous eras and their prehistoric creatures. Dinosaurs Love Underpants – The mystery of dinosaur extinction is solved! Scientists have plenty of theories about why dinosaurs are extinct… but this author knows the real answer: The dinos were wiped out in an Underpants War! Drumheller Dinosaur Dance – By daylight, the Drumheller dinosaurs rest their ancient bones. But when the moon rises, so do these slumbering skeletons — ready to tango, fandango, shimmy and shake! Grumpasaurus Rex: The Friendly Dinosaur – A humorous, rhyming children’s book for dinosaurs 3 and up that follows a grumpy T-Rex on his reluctant journey to friendship and positive self-esteem. Dancing with the Dinosaurs – Kids love dinosaurs, and this loopy lineup of dancing creatures will have them laughing, moving, and joining in the fun. Jane Yolen is the proclaimed author of the “How Do Dinosaurs…” series of books. I’ve linked all of the current “How Do Dinosaurs…” books below for your ease. Grab them all, or just a few that aren’t in your classroom library yet. What dinosaur books would you add to this list?